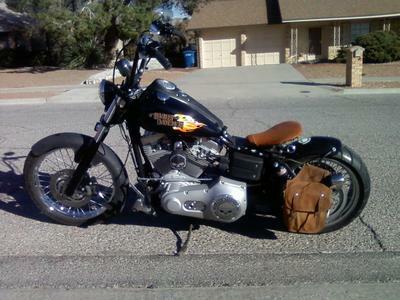 I bought this bike new FXDI Super Glide and started to custom it into a bobber. First was the Burly lowering shocks 2", modified the swing arm so a 200 mm tire would fit, Deamon 41mm front forks, 12" ape hangers, made a fiber glass rear fender and attached it to the swing arm, and lastly I made a springer seat. I love working a modifying my bike, thanks for looking.